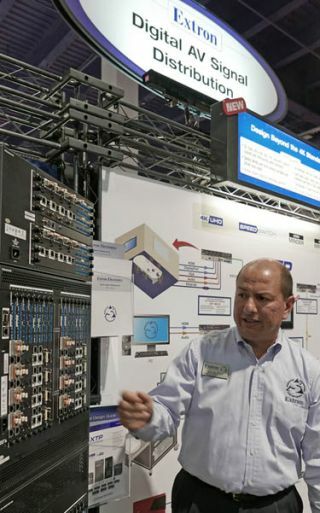 Extron's Joe da Silva shows the new Extron XTP System at the Extron booth at the NAB show in Las Vegas. Extron Electronics has added fiber optic products to the expanding XTP Systems family. This addition was introduced at the NAB show this week in Las Vegas. The XTP 4K Fiber input and output matrix boards, transmitters, and receivers enable long haul extension of 4K video, multi-channel audio, bidirectional control, and ethernet over one fiber optic cable. The XTP CP Fiber 4K I/O boards and XTP 4K Fiber extenders are HDCP‑compliant, and enable high-performance transmission of computer and video resolutions up to 4K with 4:4:4 chroma sampling. Shared capabilities include support of data rates up to 10.2 Gbps, 12‑bit deep color, 3D content, and HD lossless audio formats. Extron’s EDID Minder and Key Minder technologies ensure signal switching and distribution. XTP matrix switchers can be configured with XTP Fiber 4K I/O matrix boards to support XTP fiber optic transmitters and receivers installed at remote endpoints. Compatible with the XTP II CrossPoint Series as well as the original XTP CrossPoint matrix switchers, the XTP 4K Fiber products are available in multi-mode and single-mode models for long haul signal extension within new and existing XTP Systems applications. "We continue to see the need for sending 4K images over distances that are simply too far for a twisted-pair infrastructure," said Casey Hall, vice president of sales and marketing for Extron. "The new XTP 4K Fiber products build on Extron’s established leadership in AV over fiber. Adding signal extension over fiber to our new XTP II CrossPoint Series with the industry’s first 50 Gbps backplane or to the proven XTP CrossPoint models means each of your customers has the reliable, high-performance system that they need for long‑haul transmission of 4K video at the highest quality." The XTP fiber optic products are compatible with the XTP Systems family, and share many of the features and capabilities found on other XTP boards and extenders. For streamlined integration, the XTP FT HD 4K transmitter includes an HDMI loop‑through with selectable audio control and enables embedding of analog stereo audio signals, while the XTP FR HD 4K receiver provides selectable HDMI audio pass-through, audio de‑embedding to digital S/PDIF or analog stereo audio outputs, and relays for environmental control at the destination. The XTP SFR HD 4K fiber optic scaling receiver also features Extron Vector 4K scaling technology to support modern and legacy display devices. All XTP devices are compatible with one another. This compatibility enables complete end-to-end system solutions, and provides possibilities for future system upgrades to support video standards and formats of 4K and beyond.